pump repairs and a new coat of paint for the fountain's surface. The water works were shut down when they began leaking into the nearby Queens Museum of Art. The water features encircle the Unisphere which was built as a centerpiece of the '64 Worlds Fair. 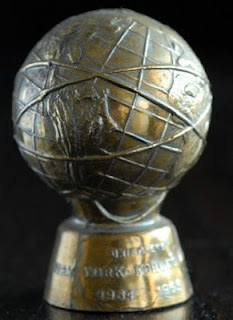 Architect Gilmore D. Clarke designed the spherical world globe, topographical relief and fountain. Made of a stainless steel cage, steel mesh, granite and colored lights, the 12-story-high globe was the center piece for the USS Steel Corporation's exhibit. It is the world's largest global structure, rising 140 feet and weighing 700,000 pounds. Commissioned to celebrate the beginning of the space age, it was conceived and constructed as the Theme Symbol of the 1964/1965 New York World's Fair. The Theme of the World's Fair was "Peace Through Understanding" and the Unisphere represented the theme of global interdependence. What would a World's Fair be without souvenirs? Various versions of souvenir buildings were made of the Unisphere in many sizes and materials. I've seen ceramic coin banks, S&P shakers, trays and other variations.